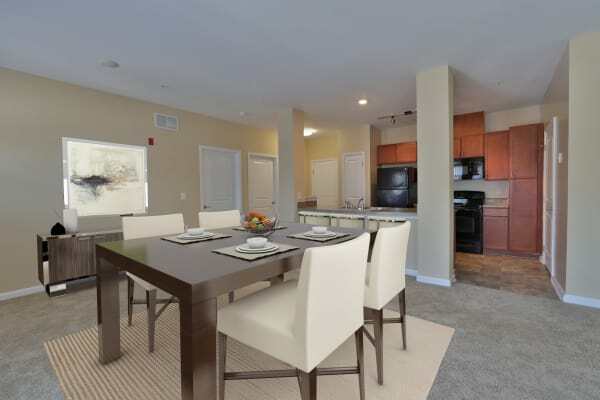 Are you looking for a 1 & 2 bedroom apartment home for rent in Ellicott City, MD. Look no further than the roomy layout options available on offer at Orchard Meadows Apartment Homes. With high ceilings in many homes and ample storage in all, we invite you to enjoy the feeling of spaciousness inherent to each of our floor plans. Plush wall-to-wall carpeting and abundant of natural light lend warmth to already high-comfort homes. In addition, soundproof walls elevate your peace and quiet and make it easy to turn your home into your haven. At Orchard Meadows, you’ll find the perfect mix of luxury and convenience. Our homes make chore days easy with each of our one and two bedroom apartments featuring a washer and dryer. Whether you need to run a single load of delicates to treat your work attire with care or if you have several loads ahead of you, laundry day simply isn’t overwhelming with a personal laundry facility at your disposal. Take a look at a few in-home highlights that you will find in every home at Orchard Meadows. Come see for yourself what sets us apart. Schedule a visit to Orchard Meadows today.